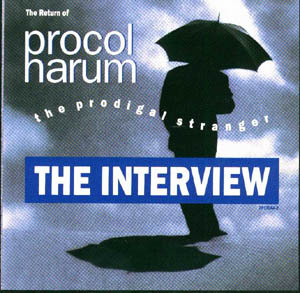 The musicians' promotional interviews were used in two ways: (a) cut together with music and a commentary; (b) separated into individual 'answers' so that DJs could appear to be interviewing Procol Harum live in their studios. Most of (a) recurs in (b), but sometimes it's in expanded form: we have used this colour to denote material added from part (b). In typing up part (b) we haven't reproduced all the material that also occurs in (a). Zoo Entertainment is proud to announce the return of Procol Harum: The Prodigal Stranger! (music starts). From those first few notes of A Whiter Shade of Pale during the Summer of Love, Procol Harum's music has endured: the classical themes, the heavy R&B emphasis, the dual keyboards and ethereal lyrics, all combine to form a sound unlike any other. Now for the first time in nearly two decades Gary Brooker, Matthew Fisher, Keith Reid and Robin Trower have reconvened for a musical feast. The results: The Prodigal Stranger. (The Truth Won't Fade Away plays). And Keith and I worked Matt Noble, that's an engineer and writer from the New York area, and we were able to kind of work out our songs and get them down on tape at the same time to listen how they were going, and we had a good week of writing, we wrote four or five songs. It's the first song I've written in many, many years that wasn't for one of my own things, you know, in other words it was for somebody else really. Although it's me that's playing it, I knew I had to come up with not a Robin Trower song, a Procol Harum song. So that made it a kind of a fascinating thing to work on. All Our Dreams Are Sold off the new Procol Harum album for Zoo Entertainment, The Prodigal Stranger. As vocalist Gary Brooker explains, the legacy of the band remains a tough act to follow. Over the years the music has only improved with time, and remains the standard of excellence by which everything on The Prodigal Stranger is measured. For one thing, we never knew if it would work out, but we did know one thing and that was that the basis of us making the new Procol Harum record would be if we could get together a good set of songs. And the next target we found, which we hadn't really expected, was well, you just can't come and make a Procol Harum album after many, many years, because people nowadays may have only heard of A Whiter Shade of Pale (AWSoP starts to play) or Conquistador or maybe A Salty Dog or something: they're quite substantial songs and records to live up to. So we had bit of a goal there in that, if we're going to do anything, it's got to be at least as good, so we had a good target to head towards. (AWSoP fades). It's such a long time ago! I think it worked very, very well. I mean, I really do think ... what we did was a great combination of musicians, there's no doubt about it. And I don't think there are many groups of musicians that could put together that much individual talent into a band that really works, you know, and I think it really did work. (end of A Salty Dog plays). Anybody that was lucky enough to be a part of that movement then will know how exciting it was. I mean things are exciting for us today, but ... you know ... it's a different sort of excitement now, people have seen everything. Those concerts and dances in the late 60s were ... everybody was a part of it. (Edmonton Conquistador in the background). Yeah. It was very much ... it was ... it was very much a celebration of music. There was ... you know ... a real feeling of the audience and the band all being together in this thing. There wasn't a sort of 'band on stage as a kind of Rock Icons or Rock Legends' or whatever it might be. There was a real feeling of celebration of music from both the audience and the bands of that time. (Conquistador cross-fades into King of Hearts). These are modern times where songs that you write and records you make can easily disappear, and I think that we really, consciously kept our eye on the fact that this was a record which was going to be listened to by a lot of people, but at the same time it had to affect them. We concentrated on it, and gave it much more effort than I think we ever have in the past ... it was very like making a first album. We've all had time to save up lots of ideas and emotions and experiences and I think that we've all put a lot of those into this album, and yet we've got the maturity and the experience to make it come out like we want. As if marking time, King of Hearts lyrics make a subtle reference to A Whiter Shade of Pale. It wasn't planned, but it fit perfectly, and became a metaphor for Procol fans who had the song burned into their consciousness. The genesis of that song is the actual line, 'The King of Hearts', and really that song lyrically built up from the chorus, you know, the king no longer being the king of hearts but the king of the broken-hearted. And that's really where that song started, lyrically. And then that took me on ... on ... on a little voyage, just took me away. When we got to that point in the verse, the card game was going on, and the characters just seemed to speak out for themselves, and they started talking about wandering through their playing-cards. So I just wrote it down. The King of Hearts, from Procol Harum's The Prodigal Stranger. It's an album filled with the signature Procol Harum sound, thanks in part to Matthew Fisher's keyboards, on songs like A Dream in Ev'ry Home (A Dream in Ev'ry Home starts to play). The basic groove of it and everything ... it was just a riff that I thought up at home ... and I sequenced it up on my computer with a bass line and a drum part which no real bass-player would ever have played or ... drummer would not have played ... it's not what real musicians would have done ... it was a very synthetic thing but which seems to work. It was typical of the way we work nowadays, what with the advantages of these computers and sequencers ... you know, that you can toss ideas backwards and forwards and change things as you go. The way it came out in the end, the atmosphere I felt about it was very much kind of um that you're alone in your room, you know, sitting back in the armchair, and you just sing that to yourself, and that kind of sparse atmosphere has stayed in the song, I think. A Dream In Ev'ry Home, from the new Procol Harum release from Zoo Entertainment, The Prodigal Stranger. (Holding On starts to play). While retaining the trademark elements of the group, Holding On features Procol Harum with third-world textures. Well we had a track which ... it was thrown somewhere towards Ethiopia, to the best of my recollection, and we needed some girls to do some chanting. And these girls came along and they were South Africans, and they were quite fluent in either Swahili or Zulu, I'm not sure what language it is; but they taught us all how to sing it, and it ended up interesting. Holding On, featuring the classic voice of Gary Brooker, back at the forefront with Procol Harum on The Prodigal Stranger. (Man With a Mission starts to play). Gary obviously is the centrepiece of the whole thing, 'cos his vocals kind of dominate, you know, he's ... he's a very very strong personality, vocally and he's done a major portion of the writing of the music. So he is definitely the centrepiece of the sound, you know. From The Prodigal Stranger, here's Man With a Mission (song plays). You couldn't possibly sing those words to the chorus without it being a triumphant march. It's a kind of very positive song. It's sort of putting things in a very positive light. We feel that our protagonist is indeed a Man with a Mission. For keyboardist Matthew Fisher, an integral part of Procol Harum, The Prodigal Stranger isn't so much a reunion as simply picking up what the band left off, twenty years ago. (Piano solo from Learn to Fly starts bashing out). It's more like riding a bike, you know what I mean, that you just sort of pick up where you left off, it's one thing that ... sort of ... you never forget it. I always found being in Procol Harum, working with Gary and Keith, rather different to any other band or any other working situation I've ever been in: to me I ... I just felt that I just sort of slotted back into it, like it had only been like the day before, um ... so it's not so much déjà vu as just carrying on where we left off. (The Hand that Rocks the Cradle starts to play). From The Prodigal Stranger, one of the album's stand-out tracks. 'The hand that rocks the cradle, gotta be gentle and strong'. It probably goes back to roots a bit more than some of the other ones, er ... I think it's just got an interesting approach to its production in a lot of ways, um, a very taxing one to sing, I might add. It was wrestled with long and hard in the studio, that particular tune. Had a lot of time spent on it. The Hand That Rocks The Cradle. Zoo Entertainment presents The Prodigal Stranger, the triumphant reunion of the nucleus to Procol Harum: Gary Brooker, Matthew Fisher, Keith Reid and Robin Trower. Twelve songs that pull you into the Procol Harum magic ... again. In a way that's what makes it a Procol Harum record, because we're all ... we all just do the thing that we do, and it works, that's the thing that sort of comes out as being Procol Harum, it's everyone totally just doing what they do. I think we probably felt that it had to be the best album that we'd ever made. That's what we were trying to achieve. Either that or die in the attempt. Finally they locked us out of the studios: we had to stop, they wouldn't let us go in there any more! Yeah, I mean we started off with a 'phone-call and here we are today talking about a finished record. And we're still working day-to-day as we have done for the last twenty-five years: the ultimate pleasure for us would be that we could go out and play to fans and people, you know, onstage and play these new songs and a few old ones, and have a few good nights out for the next few years. 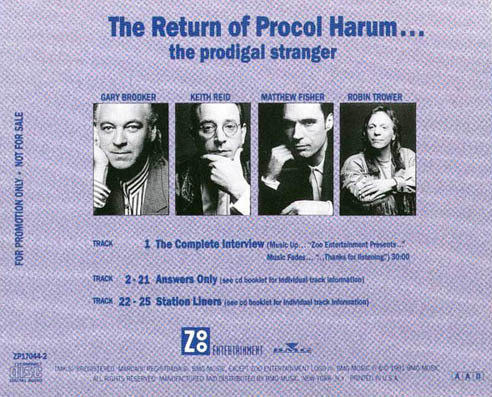 The return of Procol Harum, The Prodigal Stranger, was written and produced by Kevin Barry [...] special thanks to Bud Scoppa [...] at Zoo Entertainment [...] also to John Kalinowski of Bill Graham Management. For Zoo Entertainment, I'm Chris Taylor. Thanks for listening. Really, I saw it as being about civilisations like the Inca civilisation and other ancient civilisations, growing and being there and being wiped out and new ones taking over from them. I saw it as a movie in my mind. What is the idea behind the track, All Our Dreams Are Sold? That title isn't really meant to be taken literally. I mean that song isn't really literally saying 'all our dreams are sold', though that's a way that people might think. Another way of looking at that song is that all our dreams are sold to us. The way I look at it is a feeling of, you know, being manipulated. Who are some of the other musicians on the album? Well, he's a brilliant drummer. Yeah, Mark Brzezicki, um, who came in and played the drums, he had big shoes to fill, with the loss of BJ Wilson, who has always played drums on Procol records, but er ... Mark's a great man, that knows his instrument very well. And then of course we had a couple of other pals who helped out on doing various bits and pieces. Well the bassist, Dave Bronze, one of the great English bass-players, and we got some girl-friends of ours on one track called Holding On. Was there a game-plan to this reunion, and making The Prodigal Stranger? When I write the words I work pretty instinctively, I don't really think too much about the effect it's going to have or what people might think of it ... I really, more than anything else, go by emotion, and the emotions of the time ... I think we basically approach this whole thing instinctively ... we do what feels right instinctively, whether it be in the writing, the playing, you know, the making of the records, we just go with what we feel, and it seems to make a connection, and really that's what it's all about, making a connection with other people. Yeah, that'd be great fun. Hi! I'm Matthew Fisher, and you're listening to the return of Procol Harum, The Prodigal Stranger. Hi, this is Gary Brooker of Procol Harum, from our new album, The Prodigal Stranger, here's Man With a Mission. Hi! Keith Reid of Procol Harum here: here's a track from the new album, The Prodigal Stranger. Hi, this is Robin Trower from Procol Harum, where All Our Dreams are Sold.